Oil is valuable, but if unrefined, it cannot really be used. So must data be broken down and analyzed for it to have significance. From the GIS perspective, we believe that for geospatial data, it will be the value-added products, developed using customized methods, that will create new insights in any organization that embraces GIS. By looking at geospatial data that is created and maintained in relation to the critical workflows of your organization, you are providing everyone with a simple principle by which decisions can be vetted. Finding a cultural changing perception is generally hard, but its concept is so valuable and powerful that it will drive real change within an organization. GIS data and products are often time-consuming to create. Additionally, with the fast-growing use of some popular geovisualization tools available on the web, many individuals are resorting to faster ways to create data through estimation and approximation. Yet in examining its value to an organization, it is easier to prioritize the use of these geovisualization tools and achieve a good balance between “guesstimation” and accuracy with the use of GPS technology. 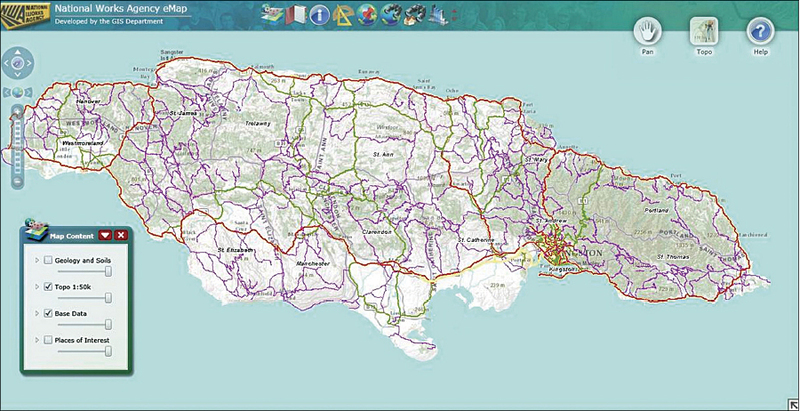 As such, at the National Works Agency of Jamaica (NWA), a critical workflow of the GIS department is to use GPS technology for mapping features, such as bridges and roads, and responding to other periodic requests from technical staff. We therefore prepare our technical staff through GPS training to collect their relevant data. Additionally, training sessions are available on request and may be carried out if an upcoming project requires new road features to be mapped. GIS personnel will also accompany internal clients to work sites and project areas. This approach not only facilitates quick access to mapped datasets but will also encourage on-site training and exposure to in-house techniques and processes by all personnel involved. All datasets are downloaded and stored to the GIS server at NWA’s head office. Therefore, collected datasets can be considered as crude, needing refinement into products and services to meet the requirements and issues of the organization. National Works Agency of Jamaica eMaps. With the influx of smartphones, collecting geospatial data is not only easier through mobility but also less time-consuming. In fact, technical officers at NWA have been encouraged to download free GPS mapping software for their BlackBerry phones to further assist in logging project area features. The beauty of this process is that the free software creates files that are compatible with our in-house GIS applications. An obvious combination with great possibilities! Customization—In some cases, where our customers are accustomed to only viewing base data as published hard-copy maps from other government agencies, the service opportunity is to help them customize their use. This means enabling them to transform existing information into their data with dynamic tools. As we customize, clients get better results from their information, and we develop a deeper understanding of their requirements, which helps to further refine the service. 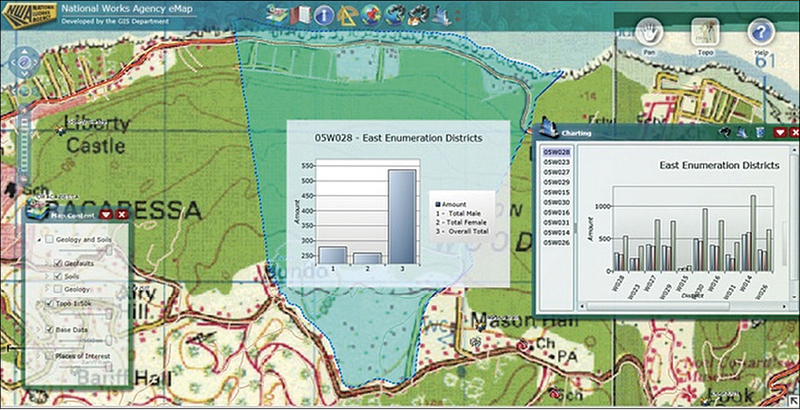 The GIS department developed an online web-based map service called NWAEMAP. NWAEMAP simply enables customers to view, search, and create custom maps using base data files published through the intranet-based application. It is unique in the way that it enables users to easily adjust their search terms and refine their maps dynamically before printing. This simple customization empowers the users to get exactly what they want, extremely quickly. It also allows them to explore the range of data available. As the customers use the service, they build value through the repeated exchange of information. Enrichment—Our technical clients have their own information that aids greatly in their workflows. This may be their GPS mapped features, such as bridges, breakaways, and roadways. The approach, in this case, is to augment that information with additional data to make our clients more effective in their job. As such, this kind of service is often about aiding decision making or enabling customers to use more customized tools for increased productivity. In doing this, our data is core to NWA’s business processes and fits directly into several departments’ workflows, since pertinent and well-presented data enables critical business decisions to be made more quickly and with less risk. Enabling—On the flip side, we also cater to users who are not geospatially technical. Their objectives require a customized solution that is based on our existing in-house platforms. Such applications create value-added services using existing data in a more cohesive and intelligent manner, therefore enabling them to collectively examine and analyze this information. NWA GIS-LAMS satisfies these users’ needs. This online GIS web application has taken accessible geospatial land parcel data online to create a service that provides GIS functionalities to nontechnical users. For NWA GIS-LAMS users, we realized that we needed to take geospatial data and refine it further by not only improving access to the information but also helping customers employ it for ordinary uses. Geospatial data requires customization for better application. The most important approach is to determine the objectives of clients and provide them with services that help in their workflows. Therefore, value-added products will be provided/created for ubiquitous use throughout the organization. Alicia Gayle is the GIS manager at the National Works Agency of Jamaica. She’s a graduate of the University of Liecester, where she pursued an MSc in GIS. Her current projects at the National Works Agency range from road works prioritization models to land acquisition data management and spatial analysis. For more information, contact Alicia Gayle, GIS manager, National Works Agency, Kingston, Jamaica.